Mariposa is an 2.5-acre upscale luxury beachfront property located in the exclusive north end of Playa Santa Teresa. Our property consists of 3 unique houses; Casa Yin Yang, Casa Monarca and Casa Morpho. All located on the same property but completely private from each other, each house comes with full amenities including A/C, Wi-Fi, fully equipped kitchens, and private pool. The property is also set up with All houses and the gardens have been equipped with a botanical all-natural insecticide "MistAway" system that protects the property from mosquitoes and other pests. The property has the privacy and security of a 2.5 acre fenced in and gated lot with ample green space, mature tropical gardens and 200ft of beachfront. We are also an easy walking distance to the grocery store (100m) and several other quaint local restaurants and shops. Mariposa is also the only beachfront property in Santa Teresa (of 95 listings on VRBO.com) to have earned a full 5-stars from TripAdvisor along with the Certificate of Excellence Award consistently since 2013. Casa Yin Yang is set back approximately 70 yards from the public beach, has an ample front yard strewn with white plumeria trees, almonds, palms and tropical flora offering privacy without sacrificing the direct beach view from various points of this house. Casa Yin Yang also offers indoor and outdoor living areas including a large terrace, beachfront yoga shala and direct access to the public beach. All bedrooms are equipped with high quality orthopedic pillow-top mattresses and 100% high quality cotton sheets, towels and beach towels. Bedding, pillows and accessories are updated seasonally. All rooms are fully-screened and have ample light, ventilation, high ceilings, ceiling fans, and separate A/C units with remote controls. -	1st Master: Suite with King Bed & Double Sliders overlooking pool & ocean. Large marble bathroom with his/hers sink, double overhead rain showers, and access to outdoor Jacuzzi and pool area. -	2nd Master: Suite with King Bed and private marble bathroom. -	3rd Bedroom: King Bed with shared marble bathroom with fourth bedroom. -	4th Bedroom: 2 Singles & a shared marble bathroom with 3rd bedroom. Chef’s kitchen with stainless steel appliances and cookware with 6 burner gas stove, ice maker, dishwasher, center island, bar/counter top to outdoor poolside dining area for 10 and an outdoor built-in gas grill. White sandy beach located directly in front of Casa Yin Yang. Perfect for swimming, boogie boarding and exploring tide pools at either ends of the beach. One of the best and least crowded surf spots in the area directly in front of the property with glassy waves year-round and 12 additional surf spots in the immediate area to explore with long glassy A-Frames that Santa Teresa is known for. The beach is not only perfect for expert surfers but also beginners looking to learn to surf the foam pile. Mariposa is completely fenced in and gated. All three (3) homes lock-up tight with their own alarm systems, laptop sized safes and a nighttime security guard from a private security company for additional security. Please feel free to contact us. We always look forward to hearing from you and, please note that we are not just here to sell you a few beds and disappear, but happy to assist you in any way we can to make this the vacation of a lifetime! toilet, shower, Shared marble bathroom between bedroom 3 and 4. Wonderful Marble, spacious & clean with attention to every detail! Prime location in quiet residential neighborhood all w/large beachfront lots directly in front of the surf break known as Santa Teresa's "exclusive north end'. Free local calls, Calling card required for long distance. Chef's kitchen: Stainless steel appliances, 6 burner gas stove, 5 burner convection oven, extractor, dishwasher, garbage disposal, natural stone counter tops, full quality plates glasses etc. Four separate outdoor terrace areas with ample living and dining areas, pool side, over-looking the gardens and the ocean. Private jacuzzi by pool w/cascade overlooking surf wave, not hot, pool temperature...it's the tropics ! Certificate of Excellence Award Winner since 2013. Direct Beach Access from the property. Walking distance to a grocery store and restaurants. Highspeed internet access. Great surf location. Private property with night time security. Full laundry, located in the house. Full access to your dedicated concierge. My husband and I added 3 days onto the beginning of our vacation and started with Casa Yin Yang. Boy are we glad we did! We have been visiting Costa Rica twice a year for the past 6 years and always stay in multiple places each stay. Casa Yin Yang was by far the cleanest, most attentive and professional place we have ever encountered! Jenni the housekeeper brought us fresh bread, homemade marmalade and fresh fruit every morning and kept the place spotless!! Thank you Jenni! Marta, the concierge was just as wonderful with a wealth of information and even scheduled us to meet up with a local fisherman to get fresh red snapper right off the boat! We used the gas grill every night, including the red snapper. Worked to perfection. The grounds are beautiful, the beach is beautiful, the pool and jacuzzi were beautiful, the house is beautiful...so grateful to Stefan for giving us the opportunity to stay at such an incredible place! Mariposa Vacation Homes, the only place I'll ever stay at in Santa Teresa. This was my second stay at Mariposa Vacation Homes, the first being in Casa Morpho. This time, I brought the family to Casa Yin Yang, the largest of the 3 homes on the property. It has a beautiful layout; open air kitchen, an excellent wooden dining table outside under an all encompassing awning that connects the two structures to give them an "all in one feel". There are multiple master bedrooms and 2 outdoor showers and a large structure housing a dual burner propane grill. From the moment we arrived we were treated like honored guests; Marta, the concierge, met us at the gate and from then on it was a most memorable vacation. Stefan, the owner, called after we were settled in to make sure everything was fine. The housekeepers, Yadira and Jenny are very friendly and kept the house spotless, even with 7 year old twins running amuck. Hector, in charge of maintenance/pool services is super friendly and the saltwater pool was always perfectly refreshing under his care. What more can I say? 5 stars for everything, especially the personal service we received, and even though we were there during the rainy season, it never hindered our fun; we surfed, zip lined in the jungle canopy, went horseback riding on the beach, waded in tide pools, listened to the geckos in the evening and chased iguanas and hermit crabs during the day, we cooked in and ate out. The zip line and horseback riding was arranged by Marta, and they couldn't have gone smoother. I'll be back in December for another surf trip! My wife and 2 young girls and another family with 3 young children stayed at Casa Ying Yang for a week in April. We had a great time. The house is right off the a beautiful beach. The area in front of the house has a great surf break for experienced surfers. 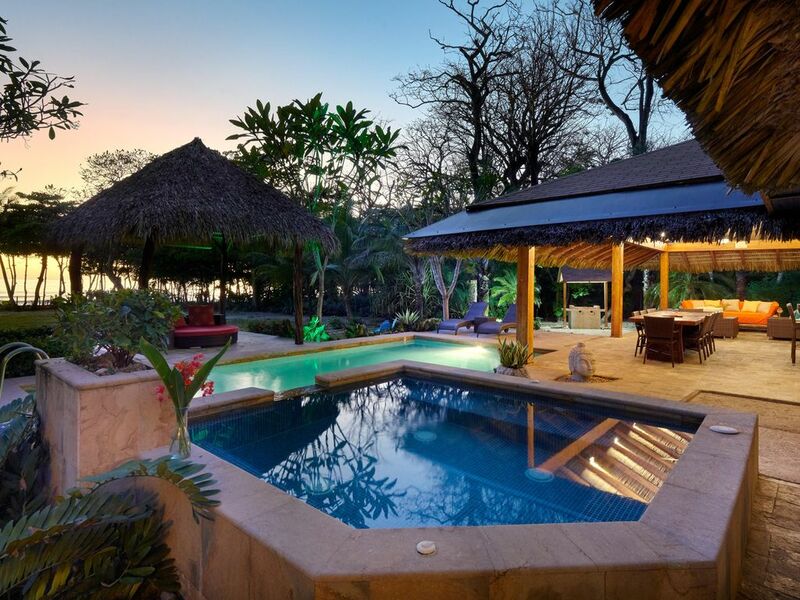 While the house is not super luxurious, it is very comfortable and absolutely appropriate for Costa Rica. Stefan, the owner could not have been more helpful. The house manager, Marta was terrific. She arranged everything that was required. Daily maid service kept the house very clean and comfortable. I would strongly recommend this house to anyone. Greatest spot on all of Santa Teresa!! Unbelievably beautiful!! Great place for a relaxing retreat. Stunningly beautiful! Casa Yin Yang was our home for a week. Everything about this home is perfect. Rather than the very nice home next door which was designed like any nice home in our home town of Orange County, CA, Casa YIn Yang is uniquely Costa Rican in it's style. Open areas everywhere. Elegant indoor/ outdoor master bath, yoga platform near the sea (perfect for massage), extensive use of exotic wood throughout. My twenty something kids had a great time surfing on the beach in front of the house. We loved this home! Please note that all rates are in US dollars.